Fiction – paperback; Penguin Modern Classics; 223 pages; 2009. Paul Bowles, an American-born writer and composer, is probably best known for his 1949 debut novel The Sheltering Sky (which I’ve not read). He penned Up Above the World, his fourth (and last) novel, some 17 years later. I picked it up by chance while browsing in the library last week and am so pleased I did. This novel is a masterpiece of suspense writing. It’s about a married couple who are taken advantage of while travelling through Central America. It’s the mid 1960s and Dr Taylor Slade and his much younger second wife, Day, regard themselves as travellers, not tourists. But for all their so-called worldliness and their willingness to visit places independently, their naiveté is somewhat alarming. Within about 15 pages I’d decided these people, regardless of wealth and circumstance, probably shouldn’t leave their own home — their trusting nature would only lead them into trouble. It all begins with one simple act of kindness. Day loans $10 to Mrs Rainmantle, a Canadian passenger on the cruise ship, who has forgotten her line of credit. When Dr Slade finds out about the loan he is mildly horrified — he thinks the “big woman with pink cheeks” is “ridiculous” and dubs her “Mrs Crazy” behind her back. It’s not that he distrusts her, he just finds her tiresome and a little bit parasitic. But later, when the Slades finish their voyage at Puerto Farol — before catching a train further inland — they find Mrs Rainmantle has checked into the same hotel. It seems there is no escaping this rather large, jolly woman, who now wants to borrow some of Day’s clothes. That’s because the British consul won’t let her take her luggage from the ship until she pays an outstanding bar bill. But once the Slades do, eventually, escape the clutches of Mrs Rainmantle, their holiday fails to improve: if anything it gets worse. When Dr Slade falls ill, Day is grateful for the help she receives from a handsome young expatriate American man, Grove Soto, and his teenage Cuban mistress, whom she has befriended. But all is not as it seems. There are aspects to Grove’s character that suggest he is not a man to be trusted, but Day doesn’t seem to have an ounce of paranoia in her body. It takes her an awful long time to realise Grove’s nefarious ways, and even then she wonders if maybe she’s just imagining it. What I really loved about this story is the way that Bowles builds up the suspense slowly but surely, so that by the time you realise what he’s doing it’s too late to back out and put the book down — you have to keep ploughing on regardless because you simply have to know what happens to these poor unsuspecting people. And yet, when he ratchets up the tension to an almost unbearable level, it never seems false or showy. There was never a moment when I thought it would be impossible to fool two travellers in this way — in other words, despite the horror of the story, it is entirely plausible, which only makes it more terrifying. And while his prose style might be economical this doesn’t mean he leaves out important detail. In one particular scene Day hears a small child in another room, but Grove insists that it could be a parrot — immediately the reader isn’t quite sure what to believe. This sense of self-doubt is everywhere in the book and it creates a growing feeling of unease in the reader. The line between truth and paranoia is a very thin one indeed. It’s only at the very end, when events are explained and you discover the true nature of Grove’s scheming ways, that you come to understand what the Slades have endured. It’s not pleasant, but then suspense novels aren’t supposed to be pleasant; they’re designed to be creepy and unnerving. 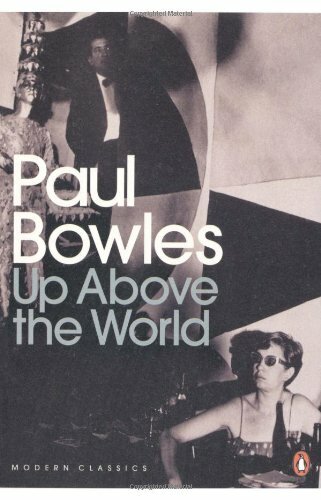 And John Bowles’ Up Above the World is one of the creepiest and most unnerving novels I’ve ever encountered. More please. It’s really terrific. I read it in the space of 24 hours… just had to find out what happened to Dr & Mrs Slade. Am now anxious to read The Sheltering Sky, so guess what I will be borrowing when I go back to the library, assuming, of course, that they have a copy in stock. I feel an overwhelming need to warn you. My bookclub chose The Sheltering Sky last year and only one person made it through and they kind of wished they didn’t. I had to put it down after about page 100, I couldn’t go any further. I found the characters aweful and the story line boring. I wonder if anyone else has read it and reacted differently? Really? I’ve only ever heard great things about it… and because of that it’s long been on my radar. I know it’s supposedly quite bleak but I quite like bleak books. I’ve put a hold on it at my local library, so I guess I’ll see which side of the fence I fall very soon. This sounds marvellous Kim, I have to say when I read’Within about 15 pages I’d decided these people, regardless of wealth and circumstance, probably shouldn’t leave their own home’ I thought this could be a book for me, does it have a slightly darkly comical twist to it or is it just creepy? Either way I am going to look this up at my library. The only Paul Bowles I have read is The Sheltering Sky, and in contrast to the comment above thought it was excellent. The tension just ratchets up and up through the story, which sounds similar to your description of this one. I think you’d like this, Simon. The character of Mrs Rainmantle does add a comical twist, I think, especially Dr Slade’s reaction to her. In fact, I was often reminded of Muriel Spark, and the dark kind of kooky but funny characters she creates. However, once Mrs Rainmantle is out of the picture the book loses its sense of humour and becomes very creepy… but I liked that. That’s good to know, Graham, as I have now reserved The Sheltering Sky at the library and am looking forward to reading it. I’m going through a mini suspense phase right now (I’ve just finished The Talented Mr Ripley), so if there’s tension in The Sheltering Sky it sounds like it will fit the bill nicely. This looks like a good find – added to my wish list thanks. I don’t usually read suspense but you’ve convinced me that I must try Up Above the World. Thanks for the tip! I am now completely torn between wanting to read this and knowing it will haunt me for ages. I find the selfish scheming in Evelyn Waugh too much to cope with, so I’m not sure I’d manage this… but I do love Jane Bowles (based on her only novel, Two Serious Ladies – have you read it?) and I feel I should explore the Bowles clan. Not read Jane Bowles… I think she lead a rather tragic life, no? A stroke at 40 or something…? I’m keen to read the rest of Mr Bowles’ work — he only wrote 4 in total. I read A Sheltering Sky last year. I must admit it was slow going. I wouldn’t say I love it but it’s a book that will haunt you even after you finished it. Such is the power of it so much so that I became apprehensive if I should watch the film or not. I hope you have a chance to read it Kim. This sounds wonderful….I particularly like your observation that the reader becomes unsure what to believe. I love when an author raises the paranoia to the next level – where you don’t only doubt what the character says and does; but start to question whether you (the reader) actually understand what’s going on.